Hopped Out Red (6.5%) Black cherries, molasses and tamarind, and that’s just the first sip. Hopped Out Red is an enormous Red Ale that masterfully mixes the sweet gloopy sexiness of a malt forward beer with the lip slashing, tongue withering bitterness of an all out Pale Ale Hop assault. The beer pours a deep conker red with a little foamy head and smells of toffee apples and brandy butter, sweet and sticky, rich and boozy. The malts are big and round and chewy, all flapjack stickiness, brown sugar gloop and earthy rye bread, while the hops whip the last vestiges of moisture from your face with blasts of lemon zest and curry leaves, cherry stones, satsuma peel and lime zest. This is a Red Ale and then some. 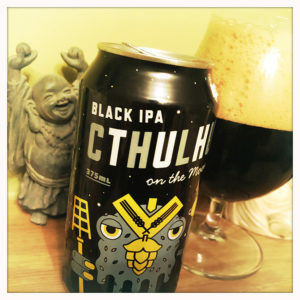 Cthulhu On The Moon (6.5%) is a Black IPA, a decent Black IPA, but nothing more than a decent Black IPA. There’s nothing earth shattering here, nothing to make you prostrate yourself before the eater of worlds. Pouring an inky black with a big fat creamy cappuccino head, the aroma is India rubber, prunes and petroleum. The malting is all burned wholemeal toast, toffee and window putty and the hops are a sharp smack of orange marmalade dusted with sherbet lemons. It’s a decent enough beer, but not enough to bring Hagbard Celine and his Legion of Dynamic Dischord to the surface, desperate to save us from Cthulhu’s wrath. 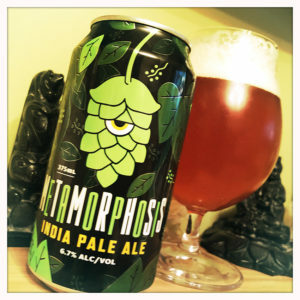 Metamorphosis (6.7%) is Kaiju’s IPA, and it’s a hop monster that’ll have your eyes rolling and your tongue curling. Jumping from its can a rich amber with a little fluffy cloud for a head, the smell is heavy with pine and peaches, and on entering you find a big chewy caramel bagel, honey shortcake malt body edged with a little salt, like the rim of a cocktail glass. The cocktail here is the mix of hops. We’re not told which varieties, we’re just left to be trampled into submission by the super fresh lime zest and mandarin, pineapple chunks, lemon sherbet, steely basil leaves and redwood resin attack that left me at least, panting and ready for the next mouthful. 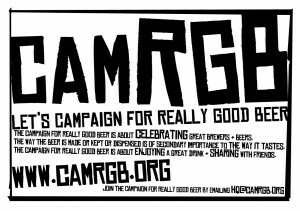 This entry was posted in Beer Review, CAMRGB and tagged Australia, Australian Beer, Beer, Beer Review, BIPA, Black IPA, CAMRGB, Can, Canned beer, Drinking, IPA, Oz, Red Ale. Bookmark the permalink.